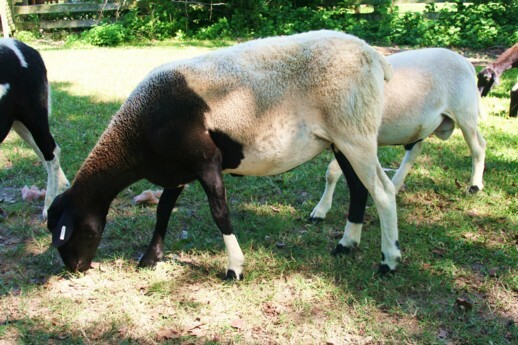 Rasta is a large, aggressive ewe who will attack a dog in an instant. This served her well when Oli The Patrol Dog climbed the fence last winter and attacked the sheep in the isolation pasture. Roanie suffered horrible injuries, Jamaica later died, but Rasta was such a "Bless her heart . 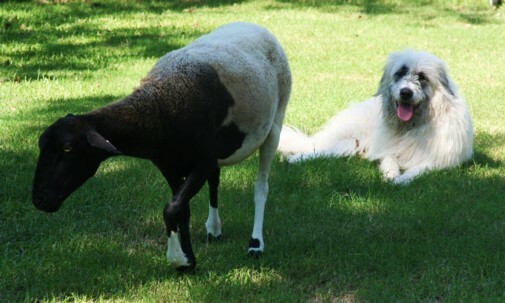 . . " that the dog went on to easier prey and Rasta was left with just a few blood stains on her wool. Rasta has a deep hatred of all dogs - even Briar. Briar tries to stay away from Rasta. Sometimes that works out for her, other times it doesn't. This morning . . . it didn't . . .
"Get away from here, DOG!" "Beat it, you stupid white dog!" "You are a DOG! 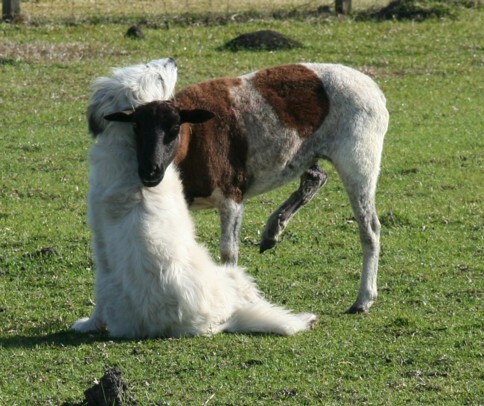 You are not a SHEEP! Don't you get it?!!" Dejected, Briar wanders off to lay down in some sand and watch the flock. But someone sees her. That Someone leaves the flock to go lend a sympathic ear. 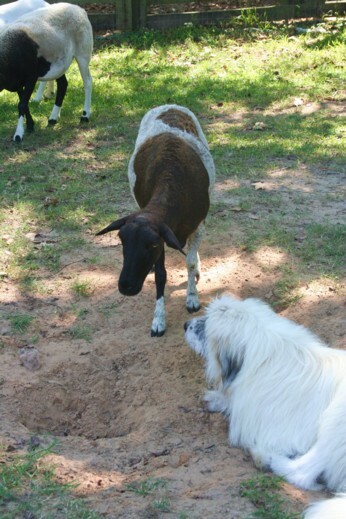 Roanie, the sheep who survived the dog attack with grievous injuries, leaves the other sheep to go stand beside Briar. 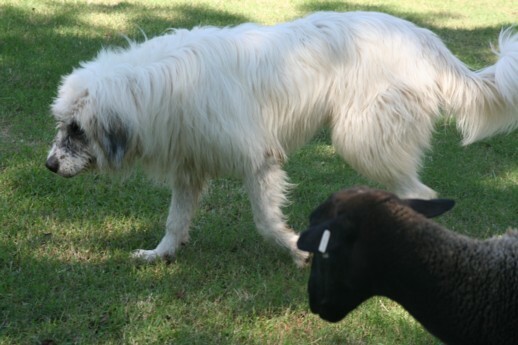 And the ewe who has every reason in the world to hate dogs, stood beside the Giant White Beast, and stayed there. And Briar felt better. Perhaps this world would be a better place if we were all a bit more like Briar and Roanie . . .
Poor Briar. :( Her situation reminds me of the sheep in Babe. All dogs were 'wolves' until Babe came along to show them that not all dogs were wolves. Maybe Briar can be Babe. Roanie is my hero today. I thought Oli was never convicted? Her lawyer will be contacting you shortly. I don't know much about guardian dogs. What breed (or mix of breeds?) is Briar? She's a sweetie! Oh, hubby and I were in your neck of the woods today; we went to Ironworks and More Rustic Furniture for a metal star to put on our game room wall. Hehehehe! You are sooo right! Oli was never convicted. She immediately called the Czech embassy! 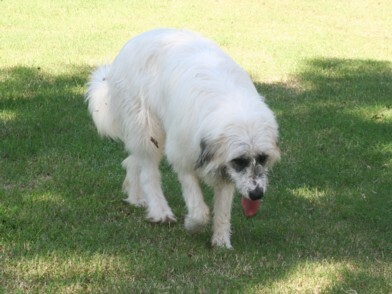 Lynn, Briar is a Great Pyrenees/Komondor cross. She is such a lovable, goofy, giant bodyguard that I fear I'll never be able to replace her! Diane, regarding that photograph: That's one of my favorite photos too! 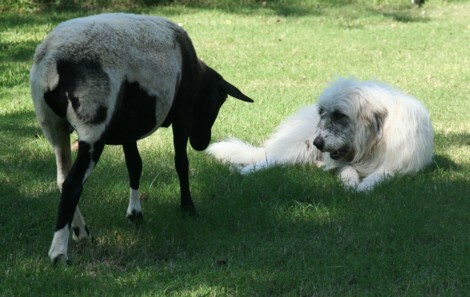 I'm a sucker for inter-species relationships and am fascinated by the friendship of Briar and Roanie. That photo captured their first meeting and Roanie's first attempt to reach out to Briar. Yes, Briar and Roanie are guaranteed smile!